To Moss Malo the award he received in 2005 as the Grain SA Developing Farmer of the Year remains one of the highlights of his farming career. Due to ill health and less favourable agricultural conditions in the past ten years, his focus has however shifted from crop farming to cattle. 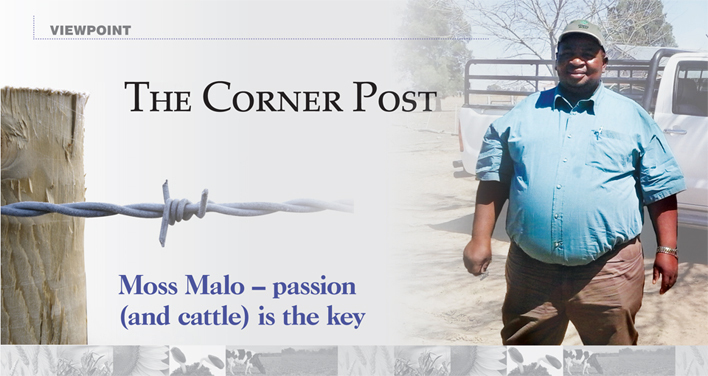 Moss, a former member of the executive committee of Grain SA, leases ground in the Stella district from the Department of Land Affairs. He previously farmed in the Delareyville district where he was a grain producer who also owned some cattle. On Homewood, his current location, he lives with Inocentia, his wife (a nurse) and three children. It is here where he decided in 2013 to focus more on cattle farming than crops. He does however still plant dry beans, maize and sunflower on 246 hectares of the 1 018 hectare farm. The remainder is used to keep cattle. Health issues forced him to rethink his farming practices a few years ago. “Without labourers it is very difficult to get crops growing when one becomes ill,” he mentions. “It is different with cattle. You can still see to them even if you are not well.” His decision was also influenced by the profitability of his livestock that helped him keep his head above water during the drought. Farming is however the career he chose and he realised early on in his career that, just as in farming, different cycles come and go. “Bad times pass if one is patient,” he says. For Moss this proved to be true in 2014 as far as cattle farming is concerned as he had a very successful year. He managed to purchase 36 Simbra cows to expand his herd to 140. “My dream is to one day own a small feedlot where I can raise calves to be sold every 120 days to increase cash flow,” he shares his future plans. “I would like to be successful so that I am able to create jobs for other people in need,” he explains. One of the reasons why he would like to give back to the community is because he would not have survived as farmer without the input from outside sources like Grain SA and neighbouring producers. Although he is not as actively involved in Grain SA as far as working groups and committees are concerned as he used to be, he will remain a member until the end of his farming career. He treasures the knowledge and guidance he received from this organisation earlier on is his farming career. “I really trust Grain SA. Without them I would not have been successful. I used to farm with my father, but Grain SA taught me what I know about farming today. I will never forget how they helped me improve my farming practices.” He emphasises that the only way to improve, is to look and listen to other successful producers. Moss is optimistic about the future of agriculture in South Africa as long as the government government realises that without farmers there will be hunger. He however feels government could support local producers on a greater scale and become more involved with price negotiations. Like what you do. Don’t become indifferent about improving farming methods. Focus on gaining knowledge. No matter how much you know, there is more to be learned. Know beforehand that it is a difficult job you have chosen. Remember, money does not grow on the farm. Hard work generates cash flow. Be a passionate farmer – love where you are and what you do.